Photographix offers film-based and digital photography - in studio or at your location. Our services are tailored to your needs. Get final chromes, negs or digital files on your choice of storage media. With digital photography, we can offer high resolution at up to 8000 x 10000 pixels, high quality and an extremely fast turnaround. 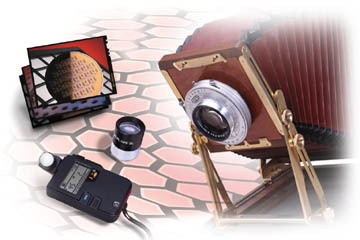 Photography on large format film gives you unsurpassed quality and a master transparency that is it's own color proof. We can produce projects in-house from start to finish involving product photos, graphic design and huge display prints and trade show graphics. Ask about "Knockouts" - a clean and simple way to use product photos in any layout document with a variety of backgrounds.